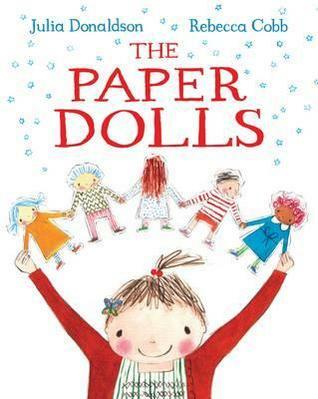 “The Paper Dolls is the breathtakingly beautiful story of one little girl and her five paper dolls. This is a delightful, light-hearted, tale showing the power of imagination, and really reminds the reader of what childhood is all about. The little girl has a mother who helps her make and decorate paper dolls. Together, they embark on adventures and meet terrifying creatures that they overcome by sticking together. They were Ticky and Tacky and Jackie the Backie and Jim with two noses and Jo with the bow. And they danced, and they jumped and they sang. When the inevitable happens and the dolls are no more, they live on in the girls memory until they are resurrected as the inspiration for new paper dolls she helps create with her own little girl. The paper dolls / Written by Julia Donaldson and illustrated by Rebecca Cobb. Published by Macmillan Children’s Books, 2012.